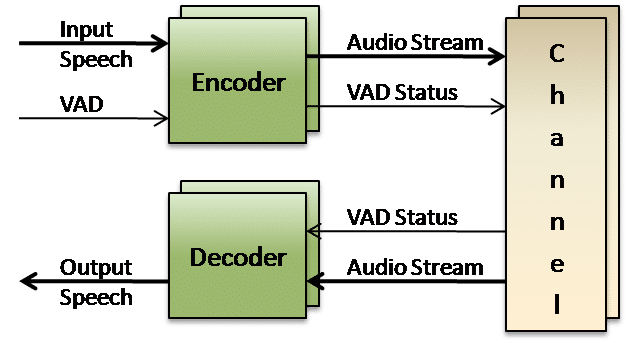 VOCAL’s G.722.1 codec is used for hands-free operation in HD VoIP systems with low frame loss as well as as an internet wideband audio codec for VoIP applications. Contact us to discuss your G.722.1 codec application requirements. VOCAL’s G.722.1 software is optimized for leading DSPs and RISC/CISC processors from TI, ADI, AMD, ARM, Intel and other vendors. G.722.1 vocoder may be licensed as a standalone algorithm, as a software library suite, as well as with a VoIP stack for different application integration options. Custom designs are also available. The G.722.1 algorithm describes a wideband speech coder that provides an audio bandwidth of 50 Hz to 7 kHz, operating at a bit rate of 24 kbps or 32 kbps for hands-free operation in HD VoIP systems with low frame loss or as an internet wideband audio codec for VoIP applications. The G.722.1 voice compression algorithm is based on transform technology, using a Modulated Lapped Transform (MLT). It operates on 20 ms frames (320 samples) of audio. Because the transform window (basis function length) is 640 samples and a 50 per cent (320 samples) overlap is used between frames, the effective look-ahead buffer size is 20 ms. Hence the total algorithmic delay of 40 ms is the sum of the frame size plus look-ahead. All other delays are due to computational and network transmission delays. The digital input to the G.722.1 encoder may be 14, 15 or 16 bit 2’s complement format at a sample rate of 16 kHz. It is handled in the same way as outlined in ITU Recommendation G.722. The analogue and digital interface circuitry at the encoder input and decoder output conforms to the specifications described for G.722. VOCAL’s optimized vocoder software is available for the following platforms. Please contact us for specific G.722.1 codec supported platforms.